A Daily Dose of Fit: Target your abs with seven simple moves. 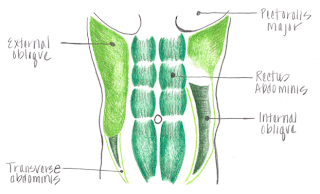 These are your abdominal muscles (except for the pectoralis major, which is only indicated to help you read the image). And as I mentioned in my post on the Pilates 100, crunches only target your rectus abdominis. To help tighten your tummy, you'll need to work everything you see in the picture above (except for the pec, of course) and I've compiled a list of seven moves that will do so. Complete one set of 12 to 15 repetitions for the first six moves—we're shooting for quality, not quantity, so really focus on those abs. Hold the last move for 60 seconds. This may be difficult at first, so break it up if you need to. 1) REVERSE CRUNCH: Lie down in crunch position (see #3 if you aren't sure), squeezing your legs together. Keep your upper back pressed to the ground as you lift your tailbone up, crunching your legs and hips into your chest. Simultaneously crunch your head to your knees. Relax and repeat. 2) SCISSOR KICK: Lie flat, palms on the floor underneath your buns. Lift your heels a few inches off the floor, keep your head on the ground. Flutter your legs as if you were swimming, keeping them straight and pointing your toes throughout. This is a small move, and one rep is complete after each foot flutters up once. 3) CRUNCHES: Lie down in typical crunch position, placing your hands behind your head with your elbows out. Lift your head, neck and shoulders off the ground to bring your ribs closer to your hips—do not pull with your arms, and keep your chin off your chest. To increase the intensity of this move, hold a light weight above your chest or use an exercise ball instead of the floor. 4) BALL PASS: This is one of my favorites! Lie on your back, legs flat and arms extended above your head so you form one long line. Hold an exercise ball in your hands. (If you don't have an exercise ball, anything lightweight and similar in size, like a pillow or empty box, will do.) Keep your arms straight as you raise the ball above your abs, simultaneously bringing your legs up. Grasp the ball with your feet and return to starting position. Repeat the motion, transferring the ball back to your hands—this is one complete rep.
5) OBLIQUE CRUNCH: Lie down in crunch position, crossing your right ankle over your left knee. With your hands behind your head, rest your right elbow on the ground and crunch toward your right knee—but don't let your left elbow fold across your face! The movement is in your abs, not your shoulders or arms. Do all repetitions on one side before switching to the next. 6) DUMBBELL SIDE BENDS: Another favorite! Stand with feet slightly wider than hip-width apart. Hold a dumbbell in your right hand and place your left hand behind your head. (If you don't have a dumbbell, a small bag of books will do. Or maybe a purse.) Keeping your shoulders to the front so as not to twist your spine, bend toward the dumbbell. Return to start, performing all reps on one side before switching to the other. 7) PLANK: Face the floor, resting on your knees and elbows (which should be directly below your shoulders). Straighten your legs and balance on your toes, keeping your head, back, hips and legs in line with each other. Hold. And that's it! Do this routine three times a week on non-consecutive days. It shouldn't take you very long at all. But to get the best results, you'll also have to maintain a healthy diet. Ab workouts alone cannot help you lose weight. Great set for abs. Now a part of my training. Thanks! !